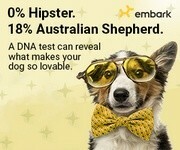 To help you find the Best Dog DNA Testing, TopConsumerReviews.com provides you with an in-depth Easy DNA Review. EasyDNA is an international company, serving customers in more than 20 countries for over a decade. Their range of services includes paternity tests and allergy testing, among many other services for people. This company also offers DNA testing for other animals, such as cats, birds, and horses. Dog Parentage: for $198, you can prove the bloodline of your dog. Expect to provide a sample of the dam, sire, and offspring for most thorough results. DNA My Dog Breed: for $79, you can have your dog's DNA compared to the EasyDNA database of 80+ breeds - the most commonly found in North America - and determine the breed mix. The company notes that this is only made for mixed-breed dogs and won't determine if your pet is purebred. Dog Allergy: for $99, your dog will be tested for allergic reactions to 100+ allergens, such as grains, grass, or chicken. Dog Inherited Disease & Trait: for $75, you can find out if your dog is a carrier, affected, or clear for at least 8 different inherited conditions, like Hyperuricosuria and Degenerative Myelopathy. We definitely recommend that you look at each test's sample report, so that you'll know exactly what you're getting when your results come. The biggest drawback is the obvious one: how much you'll spend to get a comprehensive profile of your pet. If there's only one specific area you need to know, such as paternity or breed, you may appreciate the a la carte approach. But, once you start choosing two or more tests, you're likely to get more details at a lower price by going with one of the highest-rated services we reviewed. EasyDNA has a good worldwide reputation, with a decent amount of feedback from customers who say that they got everything they were expecting with the service purchased. We weren't able to find many third-party verifications of their history specifically in the US - no BBB rating or Google reviews, for example - but we're comfortable recommending this company based on their track record in other places.